For Ryan Miller, it's guitars; for Curtis Joseph, it was trumpets. In both cases it was about the "Saint Louis Blues." ST. LOUIS — Rock ‘n’ roll, baby. That’s what Ryan Miller has been doing since arriving in St. Louis, winning seven of eight starts in goal before hitting a speed bump last night in Chicago, so it’s only fitting that his new goalie mask rocks, too. 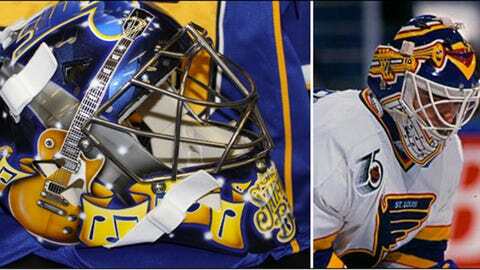 With a design that bears a remarkable resemblance to the mask worn by Curtis Joseph, it is a tribute to a great Blues goalie two decades ago. The guitars on the mask by @BishopDesigns are Jimmy Page's Gibson and Jimi Hendrix's Fender. I think it turned out great. Thanks Ray!